This is a private league, online registration is not available via the CVCC website. Please email league convener Steve Thurber to register. 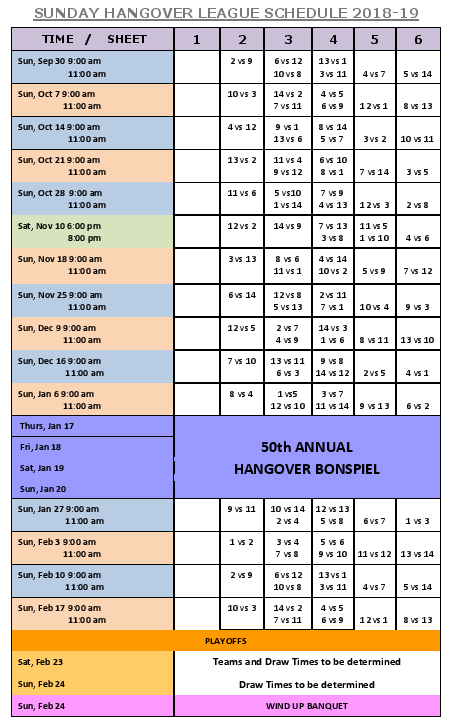 On the January 17 to January 20, 2019 weekend the Hangover Open Bonspiel happens. This is easily the most slovenly, messy, and most depraved event that happens at our club all year. On this occassion of the 50th Hangover Bonspiel 50 Teams are expected! 1000 Luckys will be crushed! 100 jugs of Paralizers will be spilled! Contact Steve above to enter. Sundays 9 AM and 11:00 AM.